I'm sure you will understand that I cannot avoid to post the RockandFrock mood of a friend I've met yesterday...she was wearing a Marni ( gorgeous ) dress from Spring-Summer Catwalk & a Céline Trio pouch in yellow...so I felt like Scott Schuman for one minute and catched her look with my i-phone...isn't she fabulous?????? hi. thanks for commend. I follow your blog of cors. Lovely bag - i like this color! Love that photo! Thanks for comment, ofcourse we can follow each other but i prefer GFC. Now i am following you and wait the same! Yellow Celine bag? Yes please! Thanks for visiting my blog - yours is way cute! Adoro il giallo... quest'anno poi sono proprio in fissa!!! I follow u follow me? Yellow is the color of this time. I'm your follower 526 at Bloglovin and also following you at Google Friend! Last week while in Milan I saw the Celine trio pouch at Corso Como 10, what a wonderful shop that is!!! Looks great, love the dress so much. Loe the yellow! love the outfit! your blog is really amazing! Thanks very much for visit my blog, I follow you on blogloving, you follow me? Love it! Such a fun dress! Vaya piezas tan maravillosas para conseguir un look espectacular. Great look! I love the color. Such a beautiful statement piece! 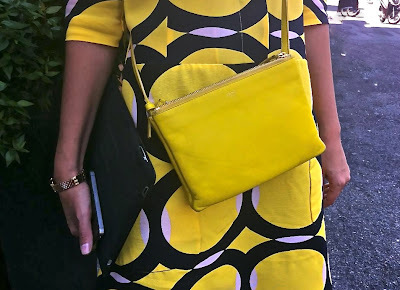 Love the yellow + print - well captured :) Now following you! awesome :-D i see the sun! Thank you so much for the visiting! Che bello questo look ,adoro il giallo ! era semplicementa estiva e perfetta. Oh love!!! Gorgeous print and bag!